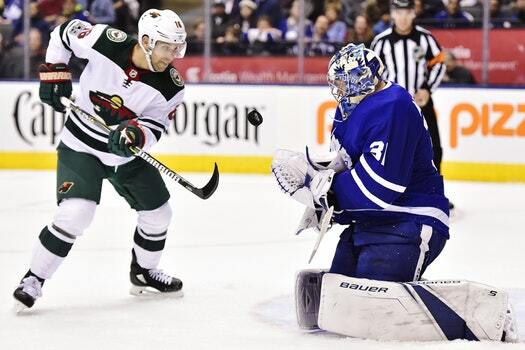 Jason Zucker is one of three finalists for the King Clancy Memorial Trophy, awarded to the NHL player who best exemplifies leadership qualities on and off the ice and has made a noteworthy humanitarian contribution in his community. The winner will be named at the NHL Awards on June 20 in Las Vegas. Zucker and his wife, Carly, raised funds for the Zucker Family Suite and Broadcast Studio at the University of Minnesota Masonic Children's Hospital, a space that allows children and their families to watch Wild games in a game-like setting. They donated $160,000 to start the project, and also contributed $1,600 for each goal Zucker, who wears No. 16, scored (33) this season. In seven months, the project has raised more than $900,000. The other two award finalists are P.K. Subban of Nashville and the Sedin twins of Vancouver. Daniel and Henrik Sedin retired after 17 seasons together with the Canucks. They made a $1.5 million donation to BC Children's Hospital Foundation in 2010 and have helped Canucks for Kids Fund raise $42 million since 2000. Subban is the founder of Blueline Buddies, a program that uses hockey to bring down barriers between police and local youth. He has pledged to donate $10 million to the Montreal Children's Hospital Foundation.